Many people are of the opinion that, while Russia has a lot of good Chinese, Japanese, Italian, and French restaurants, an authentic German restaurant is hard to come by. This isn’t true. To find a real German restaurant in Moscow, just visit any Paulaner Bräuhaus establishment, which are run by brand-manager Uwe Lindner. The German brewer and restaurateur talked to Capital Ideas about his business in the Russian capital. How did Paulaner Bräuhaus restaurants (there are two of them in the capital) first come to Moscow? Was this difficult to do? Did you start from scratch or did you acquire existing enterprises and then modify them? 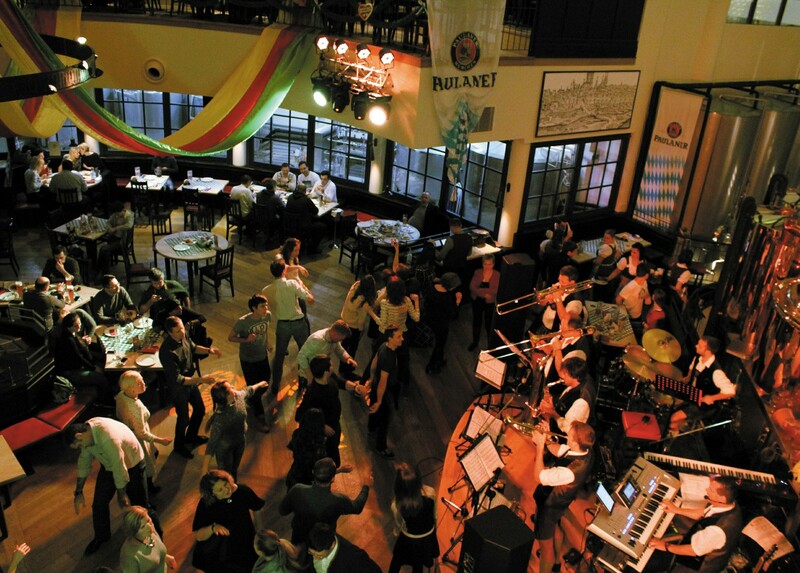 There are 35 Paulaner Bräuhaus restaurants all over the world, 6 of them are located in Russia, and two are in Moscow. These are modern Munich pubs (restaurants) with their own breweries, where guests can watch the brewing process right on the spot. In Moscow, it was especially difficult to find suitable locations for our establishments, since they require a specific infrastructure around them. Our first restaurant, Paulaner Bräuhaus Moscow Paveletsky, was the result of a complete reconstruction of a former car showroom. The second one, Paulaner Bräuhaus Moscow Olympic, was integrated into an already existing hotel/restaurant ensemble. How did you become a brand manager for German restaurants in Moscow? What does your job entail? Thanks to multiple years of working with the brewing company Paulaner München and experience acquired in my home city (Munich), as well as my work abroad in Europe and Asia, I know a lot of interesting and worthwhile information about beer, Oktoberfest, and German service. I’m ready to share my experience. This is why our local investors asked me to stay in Moscow and become an intermediary between Munich and Moscow, like a beer ambassador. Is the restaurant business in Russia different from Germany? Yes, of course, there is only one similarity: you have to make money (Laughs). People say that Asian, Italian, and Caucasian (from the Caucasus) cuisine are most popular in Moscow. How popular is German cuisine in Moscow? Who is saying this? In Russia people can be inspired by anything, especially if we’re talking about good beer, which incidentally goes well with Russian vodka. And people here are always open to new things. There are a number of German restaurants working in Moscow, but they are managed by Russians. Are they competition for you? How is your establishment different from restaurants like this? No, there is no competition. Every restaurant brings something different to the city’s gastronomic stage, and there is plenty of room and demand for a ton of restaurants considering Moscow has a population of 12 million people. What makes us different is the size of our establishments and the fact that we have our own breweries, which we enjoy showing to our guests in order to help introduce them to the process of brewing beer. Over the course of about 5 years, consumer interest in the manufacture of domestic goods has been growing here as well. On the other hand, our restaurants don’t have any private rooms, so everything is out in the open. Moreover, we make sure the guests know what they’re getting into from the outside. This is why we have large glass facades and no curtains, which prevent people from seeing what’s inside the establishment. Our guests can also participate in the traditional Oktoberfest, which is significantly different from about 20 other Oktoberfests that take place in Moscow. Do you have a lot of clients? Who are your guests? Do Germans who come to Moscow or live here come by? There is no such thing as enough clients. Of course, we are there primarily to serve people who are nearby, who come in for a pint, to meet with friends, or celebrate some occasion with us. We are also a meeting place for international business people, who gladly come here with their Russian partners and close deals. Moreover, different embassies bring their guests here, both officially and individually. Germans who live or work nearby come in often as well. Because we’re located next to major hotels, our visitors tend to be a diverse and international crowd. Are your restaurants expensive? What does the average check look like, in euros? Our prices are on the higher end of average Moscow restaurant prices to make sure that different people have the opportunity to enjoy a Bavarian pub atmosphere. Average check? It really varies from one person to the next (Smiles). Of course, Bavarian classics like Hax’n (pork knuckle) and Schweinsbraten (roast pork), as well as our dishes with German sausages. We make them at Russian enterprises headed by German colleagues that have the necessary skills and experience. Where do you get the ingredients? Can your Russian suppliers provide authentic German quality products? We purchase everything other than the raw materials for our beer from local suppliers. Russia has everything it needs. However, it unfortunately always lacks a bit of confidence in its own abilities. But that’s something that can be taught. But there are always nuances with food. For example, German mustard is different from Russian mustard, not to mention sweet Bavarian mustard. Where do you get products like this? Most brand products can simply be purchased here. Beer is a different story. You have your own breweries. 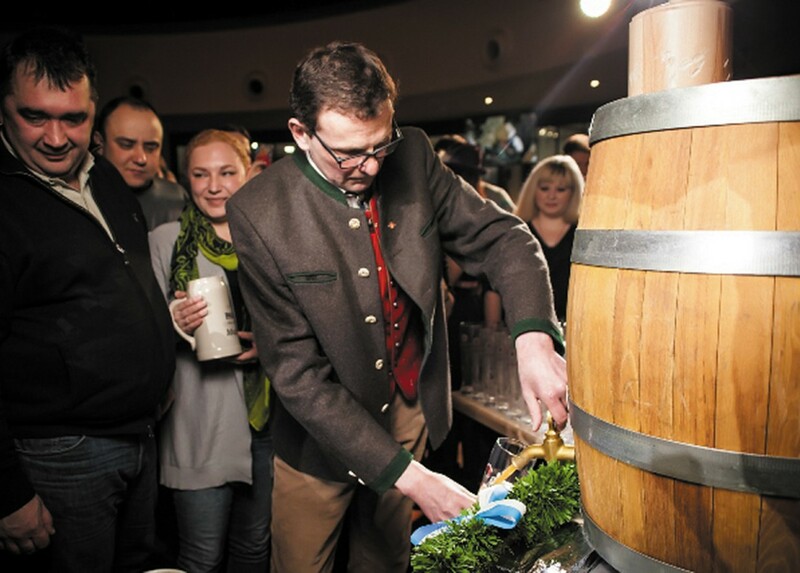 Where do you get the ingredients for your Paulaner and are you happy with the water quality in Moscow? Aside from the water, we get all the raw materials in Germany. In order to guarantee great water quality, we have installed an expensive water treatment system to ensure that the pH levels and mineral content of the water are identical to the water used for brewing beer in Munich. Where do you get your staff? You obviously have Russian cooks. Did they go through training in Germany? 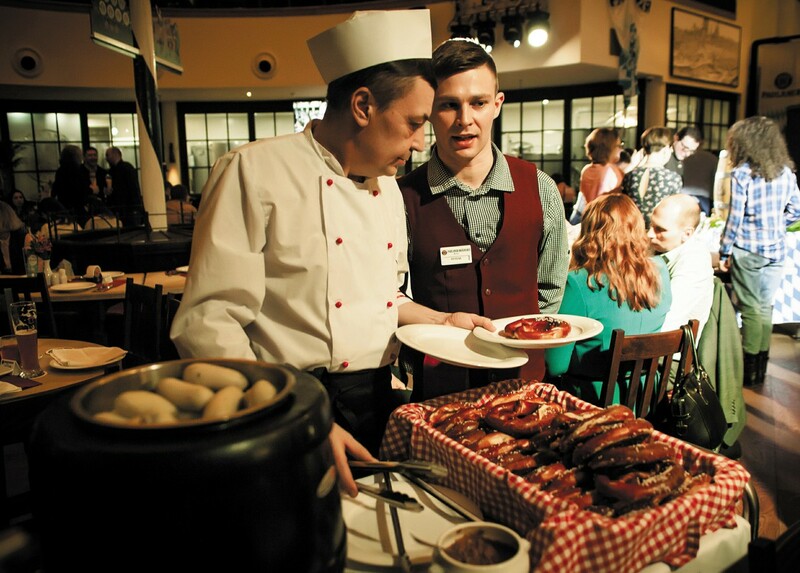 Do you train Russian waiters to know the ins and outs of German service? We don’t make anybody more German. We don’t have staff, we have employees, and I think that the word choice makes a difference. Our employees go through training and get support and help if they need it. After all, we demand a lot from them also. What kind of equipment does the kitchen use, Russian or German? Both, depending on quality and price. German restaurants have a lot of traditions. Do you stick to them in Moscow? You already mentioned Oktoberfest. Do you celebrate other festivals and holidays? What about traditional broadcasts of major athletic events, like football matches? Are you going to show the FIFA World Cup 2018 in Russia? Our restaurants have large screens and we broadcast a lot of athletic events: football, the Olympics, and, of course, Russia’s number one sport – ice hockey. Our Olympic restaurant was named the official homebase of the Russian Hockey Union in 2017. I am always somewhat amazed by this, have you ever heard 600 Russians singing their national anthem in a bar all at the same time? Have you been in Moscow for a long time? How do you like the city? I’ve been here for 5 years already. Moscow is a very fast-paced city, so it’s never boring here. What restaurants do you go to in the Russian capital? Of course I like to try cuisines from different cultures. Every once in awhile I go to the City Space Bar at the Swissotel or Sixty in Moscow City, which has a fantastic view of Moscow.